While it has always been a multi-sports club, PSV Eindhoven is mostly known as a football powerhouse. Along with Ajax and Feyenoord, PSV form the "Big Three" of Netherlands football; during their bountiful history, they have won 22 League titles, 9 KNVB Cups, one UEFA Cup and one European Cup. The club's youth setup is widely revered in the football world, with many future stars such as Ruud van Nistelrooy and Arjen Robben earning their first stripes while playing for PSV. Aerial view over Philips Stadium in 2008. Considering Eindhoven has always been a quintessential company town, it's no surprise that PSV (abbrevation for Philips Sport Vereniging) was founded by a group of Philips executives who wanted to instill a greater sense of camaraderie among their employees. Even though the original club quickly met its doom due to industry strikes, it did serve as a stepping stone to its successor – Philips Elftal. 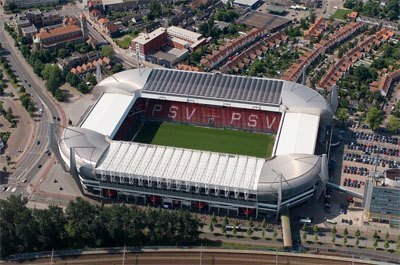 While the club was founded in 1913, it didn't change its name to PSV until 1916. Even more tellingly, it wasn't until 1928 that PSV would finally allow people outside of the Phillips company to play for the club. PSV clinched three League titles (1929, 1935, 1951) and one KNVB Cup (1950) before the introduction of professional football in the Netherlands in 1954. They were the first Netherlands club to take part in the European Cup, but these early forays were relatively unsuccessful. Following an Eredivisie title in 1963, PSV signed the talented Willy van der Kuijlen, who quickly grew into one of the top strikers in the country and the club's brightest star. For the longest time, Van der Kuijlen individual prowess wasn't translating into club success. It wasn't until 1972 and the appointment of Kees Rijvers as coach that PSV finally made appropriate use of their best player. With a team built around Van der Kuijlen's impressive technical skills, PSV started challenging Ajax and Feyenoord for the status of the best club in the country. Between 1974 and 1978, they won three Eredivisie titles, two KNVB Cups and an UEFA Cup. After eighteen seasons at PSV, Van der Kuijlen retired in 1981 as the club's top goalscorer of all time, with 308 goals in 528 appearances. Led by Ruud Gullit and Ronald Koeman, PSV continued to be a dominating force throughout the 80s. After claiming two additional Eredivisie titles in 1985 and 1987, the club won a long-coveted Treble in 1988 by defeating Benfica in the European Cup final. By the turn of the century, their trophy room was richer for another four League titles and three KNVB Cups. However, the club had never been more dominant than in the 00s. With Ajax and Feyenoord unable to form teams that could challenge for the title, PSV took notice and claimed an incredible seven Eredivisie titles and one KNVB Cup between 2000 and 2008. In 2010, they made headlines by humiliating their old rivals Feyenoord 10-0. Since then, they have won their ninth KNVB Cup in 2012 and another Eredivisie title in 2015. The current logo consists of an oval shape with a white flag with the letters "PSV" in black and red and white stripes inside. This logo was established in its first version in 1933. In the 1930s and 1940s for shorter periods another logo with the stripes in vertical direction and without a flag was used. In the previous years a black and white logo was used.